Gourmia GCM6000 is the latest release single touch 6 in 1 coffee bar with an integrated milk frother and a great deal of flexibility. 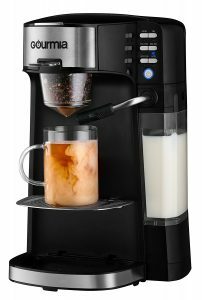 It has six separate buttons for six modes: Coffee, tea, milk foam, milk tea, cappuccino, and latte.You can use the coffee grinds, K cups, and tea leaves and brew tea or coffee through its different inserts. It makes decent foam- steams the milk nicely into your coffee cup without any effort on your side. If you’re in the mood for something quick and easy just put in a K-cup of any brand of your choice. You can detach the parts easily for cleaning and to get rid of any old coffee you simply pull up the bottom valve. The removable filter basket is dishwasher-safe. It has an efficient 1080 watt power motor (12V and 60Hz). You can make up to a 12-oz coffee or train a travel mug. It is nice being able to do a few things on one single machine. You just need to press one of the six buttons on the interface and get a tasty drink with the optimal flavor in just minutes. This Gourmia includes multiple inserts so there is never a risk of taste mix-up between your coffee and tea. You can also get hot water out of this to use with tea bags or other instant beverages. You will get a standard 10 oz cup of coffee in a brew cycle with the press of a button. If you wish to have a larger cup you just press the button again and one more when you want it to stop. It can make cappuccino or tea but not a typical espresso shot. But you can press the button once it is working to stop it earlier to get a lower volume. You may also see the different K-cup beverages including the hot chocolate . The milk foam quality is pretty good but only uses hot milk to make the froth, not cold. There is a built-in water reservoir in this unit, which you can not see in the photos. It is a good quality durable coffee bar that you can use every day. There is an instructions manual in the box but nothing to teach you how to make different coffees. But it is pretty easy and straightforward to use and you can check out the videos online. You can remove the foam maker container and keep it with the milk in the fridge so that it doesn’t go off. The water will take up to 4-5 mins to heat up and another minute to make coffee. Judging by the product reviews it is a useful product and does a good job- you’ll get a decently strong cup of coffee every single time. The removable milk tank has a 350ml capacity which is good for 1.5 cups cup of coffee. And you’ll need to refill it each time you want more cups. There is no setting for a single or double espresso but you can choose how much coffee you want to put in there, and this determines the boldness and strength. The Gourmet GCM6000 measures 10 x 12 x 8 inches. The maximum you can have in the milk and water reservoirs is 16 ounces for each- two cups of water and 1.5 cups of milk). It is much easier to use than a standard coffee maker and runs very quietly. 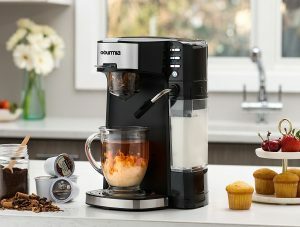 Like with other Gourmia kitchen appliances, this brand new coffee bar also comes with a year of decent warranty by Gourmia. It is a good value for money 6-in-1 machine overall.